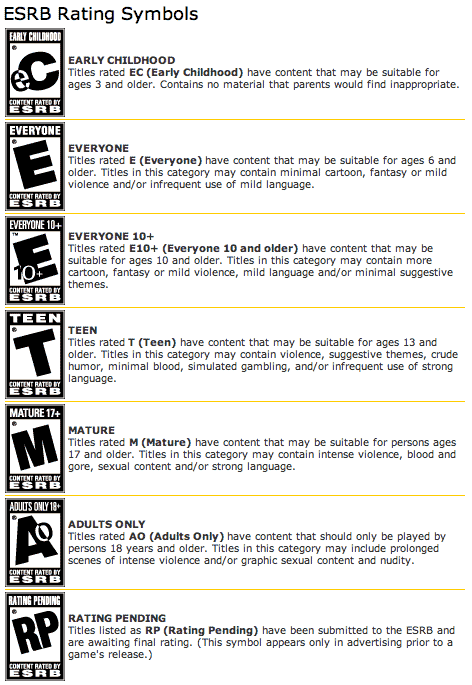 How difficult is the ESRB rating system to figure out, anyway? MediaWise has released the latest edition of its Video Game Report Card, keeping an eye on various trends in the video game-playing and -selling industry. The 26-page PDF seems to mostly read as I would expect (a lot of kids are playing M-rated games and have little difficulty purchasing them from most retail outlets, parents don’t play games with their kids, kids and parents argue about how much they should play). But the statistic that disturbed me the most had to do with parents’ knowledge of the ESRB rating system. In collaboration with Harris Interactive, MediaWise conducted a “national survey of parents and children to determine the role of video games in their lives.” This survey found, among other things, that 72% of parents “know little or nothing about the ratings system overall and many could not identify the meanings of specific ratings such as AO (Adults Only) and EC (Early Childhood).” It goes on to state that twice as many parents said they understood TV ratings as those which understood video game ratings (54% vs. 27%)! And in case you think even this is too difficult to find, every game sold in every store has an ESRB rating and explanation printed on the back of the box. Sure, the ESRB system isn’t perfect. The difference in maturity between 17- and 18-year-olds is probably not well-defined enough to deserve two ratings, and yet we have M and AO. The addition of an E10+ adds unnecessary complexity. But these concepts boil down to a damn simple buying guide: if your kid is younger than the recommended minimum age, or if the game contains specific content you find objectionable, you don’t buy them the game. Yes, even if they really really really wanna beat up hookers with baseball bats because their friends have the game and why won’t you buy it for me if their moms and dads bought it for them you don’t really love me I hate you. The sad fact of the matter is that I know parents that won’t let their kids see an R-rated movie, but they’ll let them play an M-rated game. I personally don’t believe a violent video game will beget a violent child, but if you think your child isn’t mature enough to watch The Godfather, then they’re not mature enough to play it either. Don’t feel too bad about it though, I heard that game wasn’t much to write home about. Next Next post: Apparently there’s a war on Christmas?